It was an age of revolutions. Across Europe old regimes were toppling. Marx and Engels had published The Communist Manifesto, Darwin was fine tuning his famous theory and the invention of photography was beginning to change the face of art. It seems curious then, anachronistic even, that one of the most radical paintings of the time should draw so heavily on the past, taking as its theme the Annunciation, of all things. But the relationship between the past and the present lies at the very heart of Rossetti’s artistic program. Ecce Ancilla Domini was first exhibited in April 1850 in the National Institution of Fine Arts at the Old Portland Gallery on Regent Street. It provoked critical disapproval and failed to sell. Eventually the painting was purchased by the Pre-Raphaelite patron, Francis McCracken, in 1853. The scene, an Annunciation, is one that was commonly represented in the Middle Ages and the Renaissance. It depicts Mary with the archangel Gabriel delivering the news that she will give birth to the Son of God. Ecce Ancilla Domini, “Behold the Handmaid of the Lord”, was Mary’s response to this pronouncement. The choice of subject in part reflects Rossetti’s upbringing, which even by nineteenth-century standards, was extremely religious. His elder sister, Maria, later became a nun, and following a nervous breakdown at fourteen, his younger sister Christina left school to devote herself to her own spiritual calling. Initially Christina, then eighteen, and their brother, William, sat as models for the painting. Later, though, Rossetti hired professionals for the Virgin’s hair and for the figure of the angel. The recently founded Pre-Raphaelite Brotherhood (PRB) was another important influence. Formed in 1848, the PRB, of which Rossetti was a founding member, believed that European art had been in decline since the High Renaissance. They took particular exception to the florid, “sloshy” classicism taught in institutions such as the Royal Academy, where significantly the chief members of the Brotherhood met and where they felt technical effects were valued more than truthfulness of expression. To set British art on the right course they looked instead to Early Renaissance artists, those that had preceded the academic followers of Raphael, or “Raphaelites”, for inspiration, particularly those working in Northern Europe, such as the Flemish artist Jan van Eyck whose Arnolfini Portrait of 1434 had been bought by the National Gallery in 1848. The depiction of the Annunciation within a domestic setting is one often associated with the “Flemish Primitives” and would have seemed an appropriate subject through which to express the ideals of the PRB. In autumn 1849, Rossetti traveled with his Pre-Raphaelite brother William Holman Hunt to France and Belgium. A highpoint of the trip came in Bruges where they saw works by van Eyck and Memling. 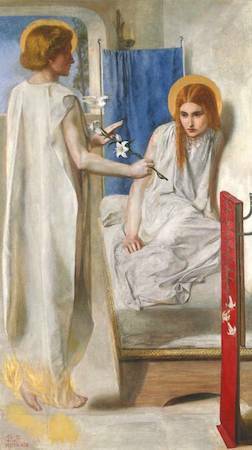 Of all Rossetti’s paintings, Ecce Ancilla Domini, begun immediately on his return to London, draws most heavily on these earlier artists, not just in its subject but also in how it was painted. Following van Eyck, Rossetti prepared the canvas with a white ground instead of the toned or dark ground favoured by the Academies. He also avoided mixing his colors, choosing only the purest and brightest pigments. As for the actual painting, it was a painstaking process, the brushes being so fine, it took Rossetti all of five months to complete. Iconographically, the painting is pretty conventional. The lily Gabriel holds symbolizes purity and is repeated on the embroidery at the foot of the bed. The flame from the oil lamp reminds us of the presence of the Holy Spirit, here portrayed as a haloed dove. Less conventionally, however, Gabriel’s angelic status is shown not with wings, but by the flames around his feet, which appear to make him float. His head is framed by a window looking onto a blue sky, suggesting the kingdom of Heaven. Blue is also used for the screen behind the Virgin, and so, though in white, she is still set against that color most often associated with her in art. Despite the wealth of symbolism, compositionally Rossetti has kept things simple. Much like the Early Italian Renaissance fresco painter, Fra Angelico, the palette is limited, dominated by shades of white, which set off carefully situated primaries: the blues of the screen and the sky, the red of the embroidery and the yellows of the haloes and the flames. This pared down, economical style avoids academic techniques, such as chiaroscuro, used to create pictorial drama and signal spatial recession. The painting’s use of perspective, or rather lack of it, attracted most criticism at the time. Even the PRBs were unsettled. Both Millais and Hunt offered to lend a hand correcting it. Rossetti refused though. With his innovative use of empirical rather than scientific perspective, like true Pre-Raphaelite ohe was paying homage to those “Flemish Primitive” he so admired, such as Rogier van der Weyden, whose own Annunciation he had recently seen in the Louvre. For a modern viewer it is hard to see what the problem was. The claustrophobic atmosphere makes sense to us. We accept the liberties Rossetti has taken, the way the setting threatens to encroach upon the figures, particularly Mary, as part of the overall design, aimed at heightening the sense of her disquiet. Instead it is the treatment of the figures that seems to us more shocking. While many artists have explored Mary’s fear and apprehension when painting the Annunication, stricken transfixed almost on her own bed, none had treated as explicitly as Rossetti does here the psychosexual nature of the Virgin’s anxiety, exposed and vulnerable in the company of an angel whose lily, phallic in shape, points suggestively to her womb. The muscles, sinews and veins on Gabriel’s bare arm alert us to his corporeal presence, while visible between the edges of his cloak, the line from his waist down the length of his thigh renders his nakedness apparent. Though subtle, these pyschosexual undertones anticipate later developments in Rossetti’s art and with her long auburn hair and “love-fretted”, cupid bow lips perhaps we see in the head of Mary the prototype of future Rossettian beauties. But the painting offers more than that. Ultimately, despite its debt to artists of the past, it is a painting that is ahead of its time, introducing formal innovations, the way the close color tonalities, for example, create a sense of harmony, that would influence many artists to come, not least James McNeill Whistler whose justly famous The White Girl owes much to Ecce Ancilla Domini. Were the Pre-Raphaelites Britain’s First Modern Artists? George P. Landow. “Pre-Raphaelites: An Introduction.” Victorian Web, 2007. Abigail Newman. “Drastic Innovations on a Traditional Theme: Rossetti’s Ecce Ancilla Domini” Victorian Web, 2004. Cite this page as: Ben Pollitt, "Dante Gabriel Rossetti, Ecce Ancilla Domini," in Smarthistory, August 9, 2015, accessed April 21, 2019, https://smarthistory.org/rossetti-ecce-ancilla-domini/.